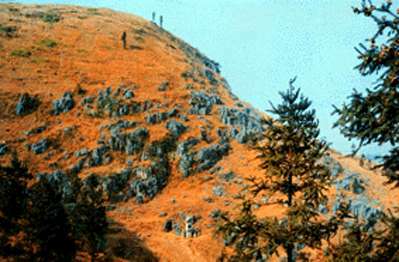 Hill in Liujiang where the skull was found. Studying the evolution of the human brain can provide researchers with insight into the developmental path of language and intelligence. It is possible to use an endocast — the impression taken from the inside of the cranium that retains the surface features of the brain — to learn about the brain structures of humanity’s ancient ancestors. Unfortunately, many of the hominin fossils that have been discovered are incomplete or are filled with a heavy calcified matrix, making it difficult or impossible to reconstruct the endocasts without damaging the fossils. The Homo Liujiang skull, discovered in 1958 in Liujiang, Guangxi, China, is the most complete and best preserved late-Pleistocene human fossil to be found in southern China, but it is filled with a matrix that prevents conventional examination of its interior. Researchers from the Chinese Academy of Sciences in Beijing, led by Xiujie Wu, examined the endocast of the Liujiang cranium in three dimensions using high-resolution industrial computed tomography (CT). Although CT has been used to examine fossils since the early 1980s, it rarely has been used to investigate those found in China. 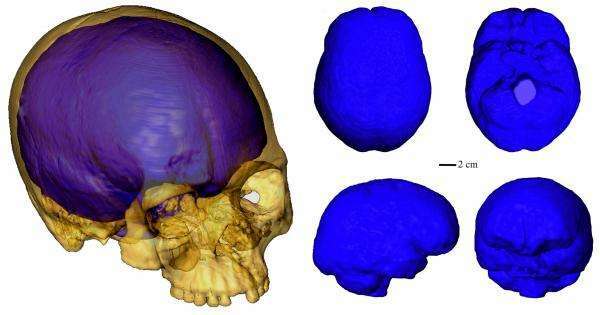 Researchers used computed tomography to scan and digitally visualize a hominin skull. A virtual 3-D representation of the skull and the endocast is on the left. On the right are images of the extracted virtual endocast from various angles. The investigators processed the scanned slice data with 2-D reconstruction software created at the academy’s Institute of High Energy Physics. They manually removed the interior matrix from the fossil in the images and transformed the scans into a 3-D model. 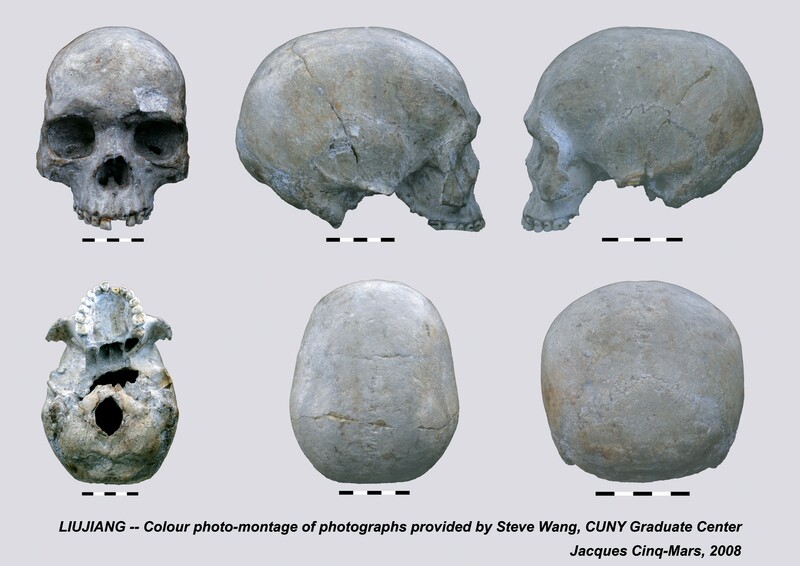 Nine standardized measurements and 11 landmarks were chosen, measured and compared with the same marks and measurements on 15 other skulls, including fossils from China, Indonesia, Europe and Africa, as well as a modern Chinese cranium. Despite the age of the Liujiang cranium, which has been assigned a date of more than 40 000 years old, the brain morphology that can be inferred from its endocast has more in common with the modern Chinese skull than with more primitive fossils. Interestingly, the Liujiang fossil has a cranial capacity of 1567 cc, well within the normal range (1300 to 1750 cc) of modern human brain size. Adapted from the Chinese Science Bulletin, January 2008, pp.2513-2519. New research, led by Wu Xiujie from Institute of Vertebrate Paleontology and Paleoanthropology (IVPP), Chinese Academy of Sciences, is reported in Volume 53, Issue 16 of the Chinese Science Bulletin. Using high-resolution industrial CT, the Homo Liujiang brain image was reconstructed. The Liujiang cranium is the most complete and well-preserved late Pleistocene human fossil ever unearthed in South China. Because the endocranial cavity is filled with a hard stone matrix, earlier studies focused only on the exterior morphology of the specimen using the traditional methods. Arguments about the phyletic (of or relating to the evolutionary descent and development of a species or group of organisms) evaluation of the Liujiang hominin fossil have existed for a long time. In this study, the authors used high-resolution industrial CT to scan the Liujiang cranium, and reconstruct the three-dimensional (3-D) brain image. Compared with the endocasts of the hominin fossils and modern Chinese, most morphological features of the Liujiang brain are in common with modern humans, including a round brain shape, bulged and wide frontal lobes, an enlarged brain height, a full orbital margin and long parietal lobes. There are a few differences between Liujiang and the modern Chinese in our sample, including a strong posterior projection of the occipital lobes, and a reduced cerebellar lobe. 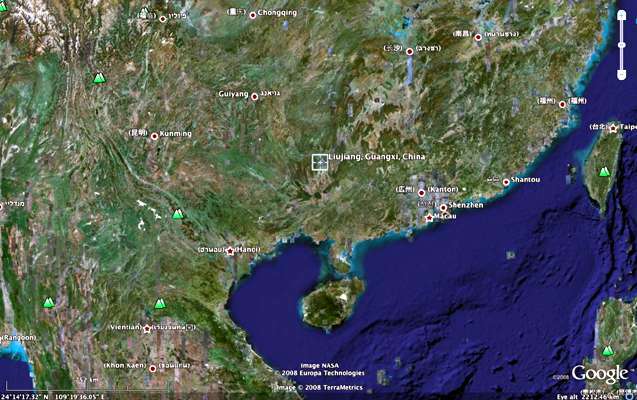 The measurement of the virtual endocast shows that the endocranial capacity of Liujiang is 1567 cc, which is in the range of Late Homo sapiens and much beyond the mean of modern humans. 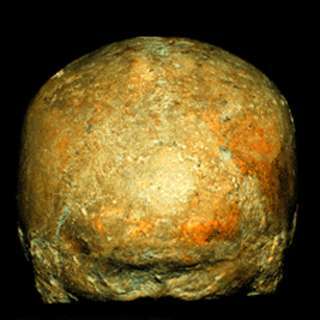 The brain morphology of Liujiang is assigned to Late Homo sapiens. It has been established that modern humans were living in the Levant and Africa ca. 100ka ago. Hitherto, this has contrasted with the situation in China where no unequivocal specimens of this species have been securely dated to more than 30ka. Here we present the results of stratigraphic studies and U-series dating of the Tongtianyan Cave, the discovery site of the Liujiang hominid, which represents one of the few well-preserved fossils of modern Homo sapiens in China. The human fossils are inferred to come from either a refilling breccia or a primarily deposited gravel-bearing sandy clay layer. In the former case, which is better supported, the fossils would date to at least approximately 68ka, but more likely to approximately 111-139ka. Alternatively, they would be older than approximately 153ka. Both scenarios would make the Liujiang hominid one of the earliest modern humans in East Asia, possibly contemporaneous with the earliest known representatives from the Levant and Africa. 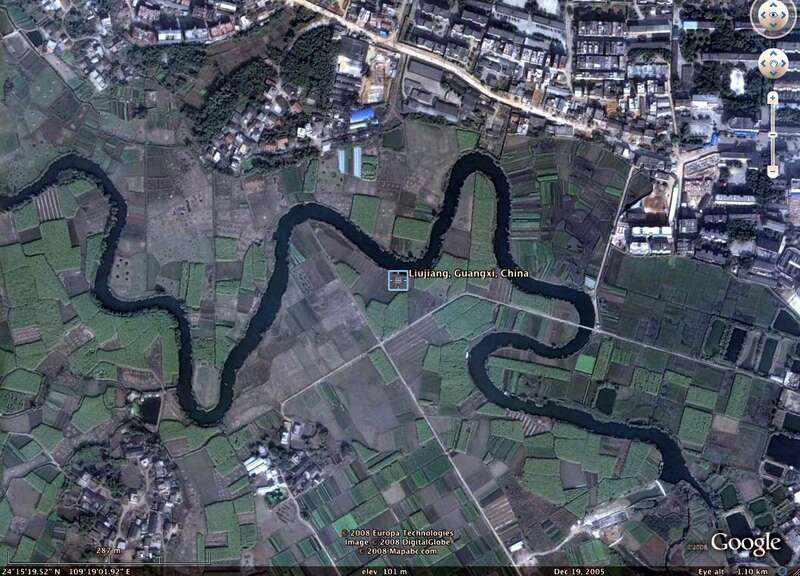 Parallel studies on other Chinese localities have provided supporting evidence for the redating of Liujiang, which may have important implications for the origin of modern humans. A uranium date of 67 000 years was reported but has been questioned on the basis of its exact location in relation to dated geological strata. 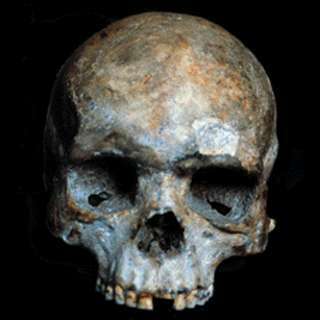 In December 2002 a Chinese group headed by geologist Shen Guanjun reported their reinvestigation of the stratigraphy of the cave and dating of the skull (extending to several neighbouring caves) and claim it should be placed in a time bracket between 70 000 and 130 000 and not less than 68 000 years ago. The skull was found in a so-called intrusive breccia a secondary flow of debris containing jumbled material of different ages. From their paper in the prestigious Journal of Human Evolution the lower date bracket of 68 000 years seems solid since it comes from multiple date estimates of the flowstone above and covering the breccia. (A flowstone forms when flowing water deposits calcite down a wall or across a floor.) Their preferred dating of 111 000–139 000 years ago based on unstratified fragments of flowstone and calcite within the breccia seems more speculative. In 1958, farm workers digging in a cave in southern China's Liujiang County discovered several human bones including a skull. Relying on its resemblance to securely dated human fossils in Japan, scientists assigned this Homo sapiens skull an age of 20 000 to 30 000 years. 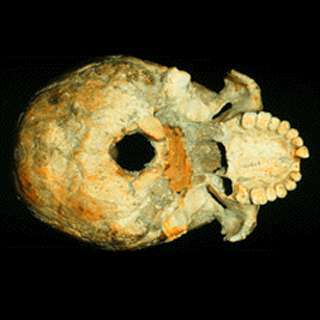 However, the Liujiang finds may be much older than that, according to a report in the December Journal of Human Evolution. The fossils probably came from sediment dating to 111 000 to 139 000 years ago says a team led by geologist Guanjun Shen of Nanjing (China) Normal University. He and his coworkers add that it's still possible that the Liujiang discoveries came either from a cave deposit dating from around 68 000 years ago or from one dating to more than 153 000 years ago. If southern China's Liujiang skull is really more than 100 000 years old this modern Homo sapiens fossil will shake up theories of human evolution. If any of these estimates pans out, "the Liujiang [specimen] is revealed as one of the earliest modern humans in East Asia," the team concludes. The presence of modern humans in this part of the world 100 000 years ago or more would roughly coincide with their earliest fossil dates in Africa and the Middle East. Evidence of such ancient roots for H. sapiens in China creates problems for the influential out-of-Africa theory of human evolution, Shen's group says. That theory holds that modern humanity originated in Africa between 100 000 and 200 000 years ago and then spread elsewhere, replacing other Homo species. If the Liujiang dates were confirmed, out-of-Africa adherents would need to find older African H. sapiens fossils than they now have or show that modern humans migrated extremely quickly from Africa to eastern Asia. The new dates also suggest that other,; more-primitive-looking Chinese Homo fossils that date to 150 000 to 100 000 years ago represent a lineage that coexisted with modern humans, Shen proposes. Scientific accounts from 1959 and 1965 of the Liujiang discoveries guided the new determination of the fossils' likely burial site. Shen's team mapped various soil deposits in the cave and calculated the age of crystallized limestone samples by using the rate of uranium decay. Uranium analyses at other sites support an ancient origin of modern humans in southern China, Shen says. H. sapiens teeth found at two other caves in this region come from sediment that his group dates to at least 94 000 years ago. 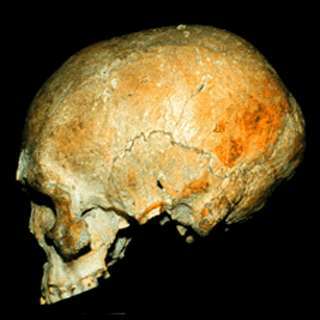 Anthropologists with divergent views about human evolution say that the new age estimate for the Liujiang skull remains preliminary. It's still uncertain how the skull got in the cave and where it was originally buried, remarks Christopher B. Stringer of the Natural History Museum in London. Stringer, an out-of-Africa proponent, says that Shen's team members need to date either the skull itself or the calcite clinging to its surface to make their case. Milford H. Wolpoff of the University of Michigan in Ann Arbor agrees. "I'd love for the Liujiang skull to be as old as Shen proposes, but we'll never know for sure without directly dating the specimen, " Wolpoff holds. In his view, modern humanity evolved simultaneously in Africa, Asia, and Europe over the past 2 million years. Shen says he hopes to work out an agreement with Chinese officials in charge of the Liujiang skull to date the specimen directly.